It is with great sorrow to announce that Andy Smith, Jr. of Virginia Beach, VA passed away on Sunday 25 November 2018 at his home in Virginia Beach. Andy aka June was born 13 February 1951 and graduated from Stanley High School in June 1969, after which he enlisted in the US Navy in April 1971. 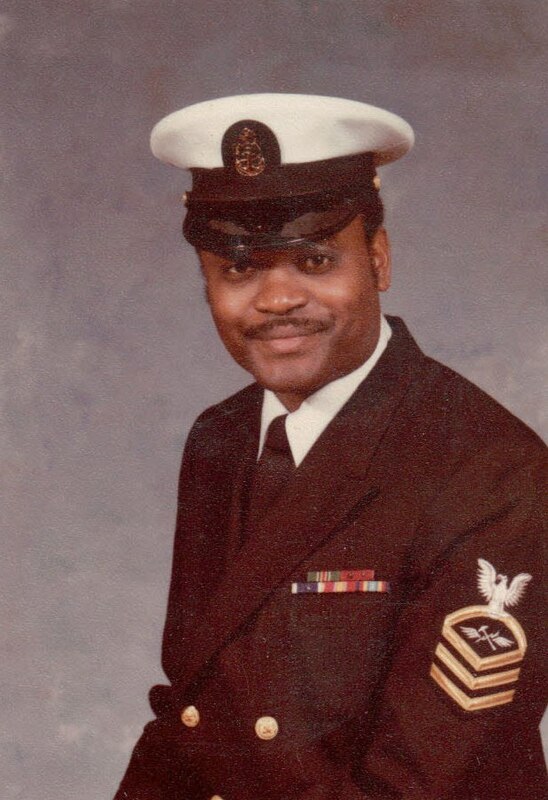 During his Naval career, he earned and was awarded National Defense service medal (2), Battle “E”, Meritorious Unit Commendation, Service Deployment Ribbons (4), Navy Expeditionary Medal, Navy Achievement Medal, Navy Recruiting Ribbon, Southwest Asia Service. Andy served on several ships USS Nimitz (CVN-68), USS America (CVN-66), along with several years of Recruiting duty advancing to the rank of Chief during his career. Shortly after Ruth arrived at NAS Jacksonville we met and were later married 7 September 1974. On 29 November 1975, we were blessed with our first son, Edward Deshawn Andy 111 on April 26, 1978, son, Michael Harris on 9 May 1982 and daughter, Samantha Nicole on 18 June 1985. Although Andy spent a lot of time at sea, our family shared many joyful times together. I tried to make it easy for him to remember the kids birthdays…..Andy born right at Easter, Mike born on Mother’s Day, Sammie born around Father’s Day and Edward born 3 days after my birthday and of course I was born on Thanksgiving. He didn’t have an excuse even for his own birthday with was a day before Valentine’s Day…..Laughing out loud. He was passionate about working on cars from a younger age, loved spending time with grandchildren as often as he could. Andy was a great salesman and his favorite sports were golfing, bowling, walking his dog, Missy even though I think she enjoyed it more. Missy also left us this year after almost 17 years, we miss her also. Andy was preceded in life by father, Andy Smith, Sr.; nephew, Rubin Smith and grandparents. Survivors and loved ones include wife, Ruth; mothersons, Edward (Lena), Andy (Jae), Michael, and Samantha; mother, Edith L. Smith; siblings, Ernest (Katie Lee), Veronica (John), Otis Bernard (Sharon), Manzell (Renetta), Vanessa, Tracy (Mary Jane), Jennifer (Nelson) and James; grandchildren, Essence, Donovan, Eyan, Ethan, Kamrin, Landon, and Jakobi and a hosts of aunts, cousins, nieces, and nephews. I was stationed with Andy on the USS America in the early 1980’s.Many memories. RIP Shipmate. My condolences to the family. I worked with Andy at Sears Pembroke for many years. Praying that God keep his loving arms around his family during this time of sorrow?? Sorry for your loss. Your dad was always nice when I saw him growing up and at Sears. May God give you strength in your time of need. To the family, I send you my deepest condolences from afar. You are in my thoughts and prayers. May God keep you and give you strength. I’m sorry that I can’t attend the service tomorrow. Please know that you’re on my mind. Next John G. Beamon, Jr.